Gerry Adams launching Sinn Féin's national programme of events to commemorate the centenary of the 1916 Rising. FIANNA FÁIL IS making a last ditch attempt to stop Sinn Fein holding the office of Lord Mayor in 2016. Under an agreement reached last year, a Sinn Fein councillor will take over the position of Lord Mayor of Dublin from outgoing independent Christy Burke – who was previously a long-standing Sinn Féin member – at tonight’s council meeting. The role is likely to go to the party’s south inner city councillor Críona Ní Dhálaigh with the support of Labour, the Greens and some independents. It means Sinn Féin will hold the mayoralty during the centenary of the 1916 Rising. In an attempt to stop this from happening, Fianna Fáil councillor Jim O’Callaghan has put his name forward for election tonight along with independent councillor Mannix Flynn, who is likely to have the backing of most Fine Gael councillors. The one demand that Sinn Fein had last year was not that the Council reverse policies of austerity but rather that it would hold the office of the Lord Mayor during 2016. That was Sinn Fein’s one absolute demand. A year ago Fianna Fáil saw through this and refused to be part of the attempted hijacking of such an important event. Other parties, however, did not – namely the Greens and Labour. O’Callaghan said he has “great respect” for Ní Dhálaigh, who he described as “a very hard working councillor”. However, he had no praise for her party. “Everyone knows that Sinn Fein is a party that operates democratic centralism. All decisions about next year will be made by a small cabal, mostly based in Belfast. My fear and the fear of my party is that Sinn Féin will hijack this important year of commemoration to justify the 30 year pointless and counterproductive campaign by the provisional IRA. Sinn Féin will seek to associate the sacrifice made by the men and women of 1916 with the horrific violence and disrespect for human life that dominated the provisional IRA’s 30 year campaign. Councillor Mícheál Mac Donncha, deputy leader of Sinn Féin on Dublin City Council, said the claim his party is trying to hijack the centenary is “laughable”, accusing O’Callaghan or trying to “grab a headline on the day of the mayoral election”. “All parties on the council, including Fianna Fáil and Fine Gael, had the opportunity to hold the position of Ardmhéara during the council’s term if they had accepted the rotation of the post as proposed by Sinn Féin, the largest political party on the Council. They refused to do so. “In other councils around the country Fianna Fáil and Fine Gael have monopolised mayoral posts, excluding other parties and independents. That is the only ‘hijacking’ that is going on,” Mac Donncha said. Fine Gael is also opposing Sinn Féin’s candidate tonight, but its group leader Kieran Binchy said most of his colleagues would be backing Flynn as “very few want to support Jim O’Callaghan”. Binchy also said he was concerned that Sinn Féin will try to exploit the mayoralty next year to justify the violent campaign in the North. “There is no whip in place but most if not all of the Fine Gael group will support Mannix,” the councillor told TheJournal.ie this morning. Flynn previously said he was putting his name forward for the mayor position as he has “grave concerns” about Sinn Féin holding the role next year, citing its handling of allegations of child sexual abuse in the republican movement. Sinn Féin is the largest party on the council, with 16 seats. TheJournal.ie has contacted the party for comment. 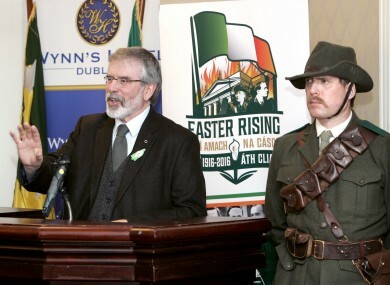 Email “Last-ditch attempt to stop Sinn Féin 'hijacking' 1916 centenary is 'laughable'”. Feedback on “Last-ditch attempt to stop Sinn Féin 'hijacking' 1916 centenary is 'laughable'”.